The easiest way to land big fish is with a gaff. They take up much less space than a large net, and are a must have item if you plan on targeting big game from your kayak. 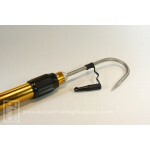 All the gaffs listed here will float and the sizes are perfect for kayak fishing.